Finished Jul 2018. Final score: 4 / 5. The author is from my hometown. Who has not heard of the Alien movies? This is my first time reading an Alien novel. This was a slow starting sci-fi story that delivered quite nicely when finished. Dorian Sudler is a project fixer. After reviewing spreadsheets, his favorite strategy to fix a project is to fire everybody and collect his bonus for the money saved. He was sent to The Cold Forge, a research facility in space that studies Aliens, cryptography, and other stuff, to audit and make recommendations. Let the firings commence and grow Dorian's God Complex. The setup is decently interesting. My main complaint about this book is that there was not enough Alien. At halfway through the book, it is still interpersonal relationships and setting up the experiments that go horribly wrong. Give me Aliens! Give me exploding chests with more Aliens popping out. Give me face-huggers. Give me desperation as the woefully unqualified scientists try to save themselves and quarantine. Perhaps Alex is trying to satisfy multiple audiences? I imagine people like reading about poor behaviors within intra-office politics. Maybe they like reading about the eternal struggle of capitalism versus pure science research? The book touches these topics. As for me, I wanted Rambo in outer space. After all, the cover art has an awesome looking Alien. The book does get there. It just took a dozen chapters for it. Special mention: Dr. Blue Marsalis is easily the most interesting character. Alex gave himself a lot to work with regarding Blue. She is very ill from a rare disease. Her illness makes her weak and nearly bed-ridden. Thus, her wits versus brawn are required to survive. She is studying Aliens in an effort for a major discovery to cure herself and others. While doing this, she is breaking the rules to further her goal (that ole business vs research tension). While in bed, she assumes control of an android named Marcus. The situation reminded me a lot of the John Scalzi book Lock In. Blue is the complete opposite of the athletic corporate brute Dorian. That contrast is explored well. However... I think Alex may have taken Blue's handicap a bit too far. Blue is constantly on the verge of death navigating dire situations. Seriously, if she is so ill and frail, she should have collapsed 5 scenes ago. This plot foible is forgivable. When this book finally got moving, it delivered exactly what I wanted. The bodies hit the floor. A couple chests exploded. Dorian's evilness became unhinged. Then I received an actual ending instead of a send-off to the next book. All good stuff. If you like the Alien movies and wished to spend a little extra time in the characters' heads, you'll like this book. I give it a solid 4. 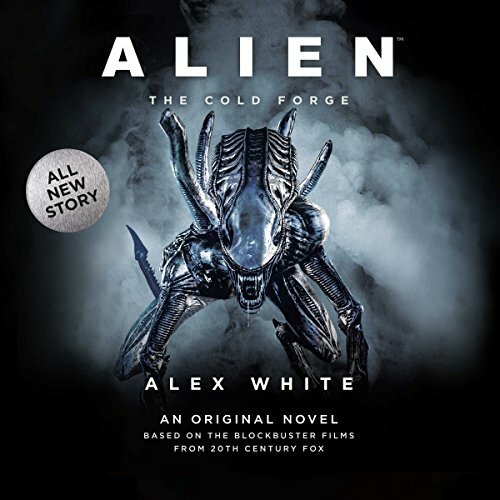 Discuss Alien: The Cold Forge in the forums.